Trim and cube beef to 11⁄2 – 2” cubes. Melt about 2 teaspoons of butter in a large saucepan. 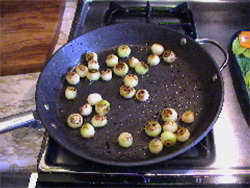 Add onions and sauté until brown on the outside but still firm, stirring often. To the same saucepan, add another teaspoon of butter. 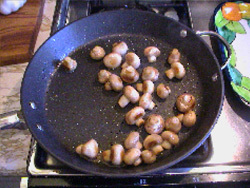 Add mushrooms whole and sauté until lightly browned, stirring often. 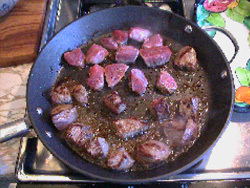 Brown beef in batches, adding additional butter as needed and set aside. 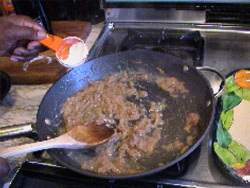 Ensure that there is remaining fat and juices in the saucepan. Add flour, a dusting at a time and form a rue with the remaining fat. 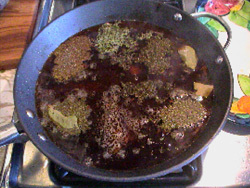 Slowly add beef stock to thin out the rue until all stock is added. Don’t worry if it goes lumpy, as it will all work out in the end. Try to eliminate the lumps with a whisk where possible. 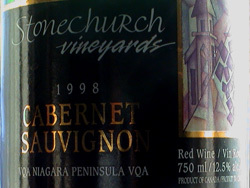 Add the wine and tomato paste to the stock and blend. 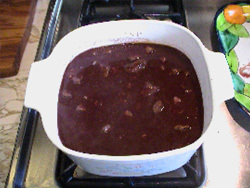 Bring stock to a boil, stirring as it heats to thicken. Add garlic, thyme, bay leaves, black pepper and salt. 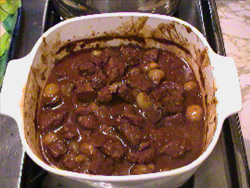 Add meat to an empty 2 quart casserole dish. Bake in oven at 350°F for 11⁄2 hours in a covered casserole dish. Add onions and bake for another 15 minutes. Add mushrooms and bake for another 15 minutes. Let cool for 10 minutes, then serve over egg noodles.